U.S. Representative Duncan Hunter (R-CA) has withdrawn as a candidate for the Republican nomination for president. He said yesterday, "Today we end this campaign. I ran the campaign exactly the way I wanted to, and at this point not being able to gain traction in conservative states of Nevada and South Carolina, it's time to allow our volunteers and supporters to focus on the campaigns that remain viable." He did not endorse any of the remaining candidates in the Republican nomination race. 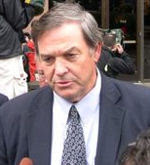 Rep. Hunter launched his candidacy a year ago and emphasized a strong national defense and immigration in his campaign. Hunter did help influence the debate among Republican presidential hopefuls by urging the construction of a border fence with Mexico to counter illegal immigration and by warning of the threat posed by China's military and economic power. He said in concluding his race, "The failure of our campaign to gain traction is mine and mine alone. But we have driven the issues of national security, the border fence, the emergence of China and the need to reverse bad trade policy." Conservative republicans greatly respect Rep. Hunter for his stalwart support in protecting our borders and supporting the military. Hunter had been elected to 14 terms in Congress and had previously announced he would not run for another term. His son, Captain Duncan D. Hunter, is running for his congressional seat. We hope his talent will be called upon to serve in the next Administration. With his military background and fervent support of the troops on our nation, he has great potential to be either the Secretary of Defense or the Secretary of Homeland Security. Tags: Duncan Hunter, Election 2008, GOP, presidential candidate To share or post to your site, click on "Post Link". Please mention / link to the ARRA News Service. Thanks! I commend Duncan Hunter for standing up like a true Statesman and accepting all the blame for the lack of interest in his campaign. However, the blackout on his message by the lamestream media is all too apparent and the fault isn't solely his. Wake up, America. Stop fallowing the lamestream media like little sheeple. This is a sad day. I am deeply saddened that Duncan Hunter has dropped out. I am completely lost as to who to support now. My hopes were high, but I knew they were likely unrealistic.